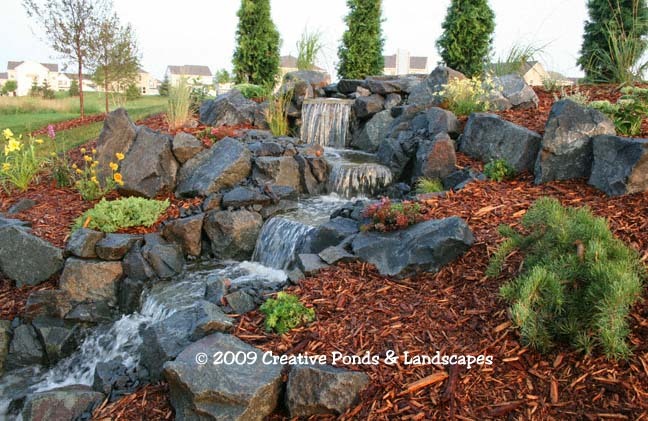 Backyard pondless waterfall & landscape installation in Woodbury MN. 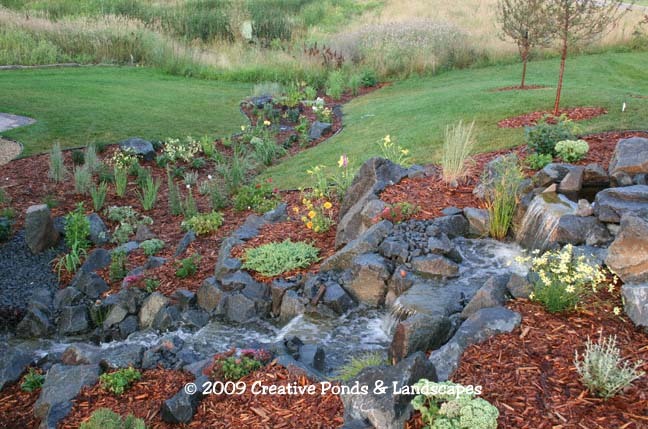 Creative Ponds & Landscapes is a pond & landscape contractor/installation company specializing in backyard ponds, waterfalls, pondless waterfalls, fountains, assorted water features, low voltage landscape lighting & landscaping in St. Paul/Minneapolis MN. and the Twin Cities surrounding area. Located in Woodbury, MN. and installed in August 2008 this 20' long Dresser trap stone "Pondless" waterfall was created to take advantage of an existing steep hill and can be enjoyed from an overlooking sunroom & backyard patio area. An existing low lying landscape area was incorporated into the waterfall area and the entire landscape installation was completed with a large variety of ornamental grasses, perennials & trees. The Easy Pro Inc. "Just a Falls" waterfall components were used to create this disappearing waterfall. NEW! Clicking on the Before photo will open a page showing both the Before and After photos. NEW! View waterfall video clip by clicking on a file link. Click Here to view a .wmv file (1.45 mb file) or Click Here to view a .mpeg file (2.47 mb file) of this waterfall & landscape installation. "What People Are Saying"... "Chris; May I join the growing list of your clients who have had a most enjoyable experience of working with you on a waterfall / landscaping project. 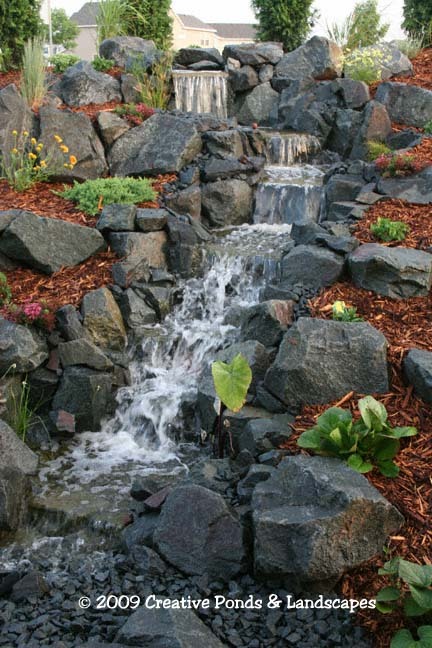 The pondless waterfall and extensive landscape plantings you designed and installed are stunning! Although challenged by a difficult site, the final result integrated a solution to a wet landscape area with dry slope planting areas inset with a waterfall that looks as if it grew naturally out of the hillside. Your attention to every detail of the project was quite simply amazing. Many companies talk about exceeding customer expectations, you actually live it! Thanks again Chris". Mike T.
© 2012 Creative Ponds & Landscapes No parts of this web site, or any of its contents, including images and written text may be duplicated in whole or in part without written permission.